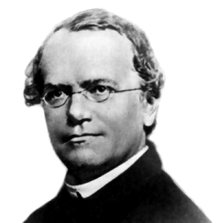 Gregor Johann Mendel (Julie 20, 1822 – Januar 6, 1884) wis a German-speakin Silesian scientist an Augustinian friar who gained posthumous fame as the foonder o the new science o genetics. Mendel demonstratit that the inheritance o certain traits in pease plants follaes particular patterns, nou referred tae as the laws o Mendelian inheritance. The profoond signeeficance o Mendel's wirk wis nae recognized till the turn o the 20t century, when the independent rediscovery o these laws initiatit the modren science o genetics. As a choiald he worked on tha mendel family farm. ↑ "Mendel, Mendelism and Genetics". This page wis last eeditit on 12 Apryle 2017, at 04:37.